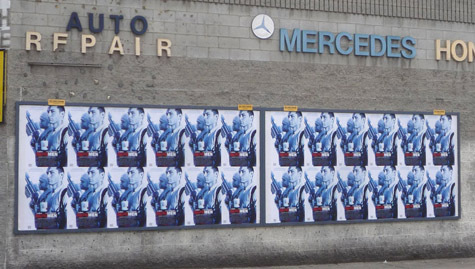 A dozen years ago, a company called MetroLights put up hundreds of unpermitted advertising signs that mimicked the legal bus shelter and kiosk signs on public sidewalks. A few years later scofflaw companies named SkyTag, World Wide Rush, and Vanguard draped buildings all over the city with multi-story supergraphic signs. Now an unknown company is blighting the landscape with unpermitted advertising signs on plywood walls thrown up around businesses, churches, and other sites. 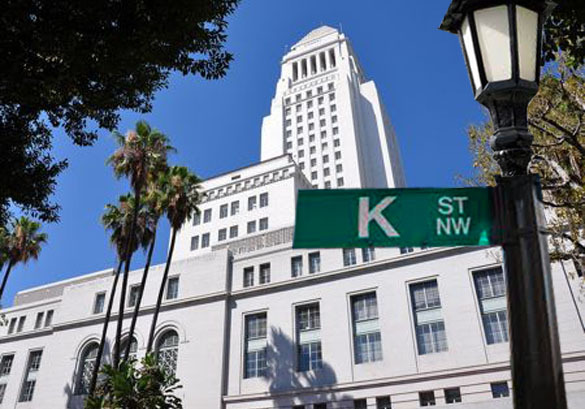 With major signage issues pending before the City Council, L.A. billboard companies spent just over $1 million lobbying city officials in the first six months of 2014, according to City Ethics Commission reports. Reports are required to be filed quarterly, and the three-month period ending June 30 marked the sixth straight quarter that billboard companies paid more than half a million dollars to firms to lobby on their behalf. As usual, the leader of the lobbying parade was Clear Channel Outdoor, the billboard division of the Texas media giant, Clear Channel Communications. The company that has mounted a highly-visible public effort to persuade the City Council to allow more digital billboards paid four different lobbying firms a total of $241,000 for the six-month period. Others writing big checks to lobbyists were CBS Outdoor, at $195,000; JC Decaux, at $189,00; and Lamar Advertising, at $136,000. 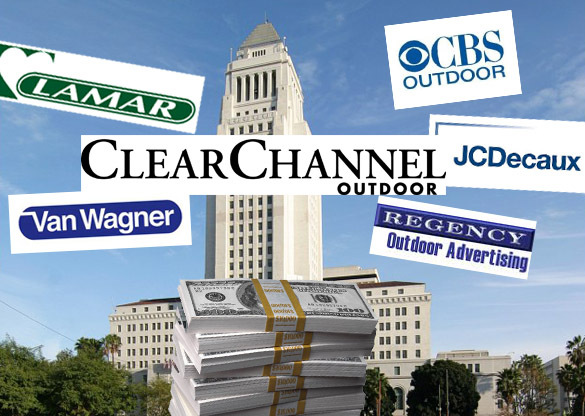 CBS Outdoor and Lamar, along with Clear Channel, are also members of the Los Angeles Outdoor Advertising Coalition, which spent $122,972 to influence city decision-makers. Louisiana-based Lamar is suing the city to force it to issue permits for 45 new digital billboards. JC Decaux, a French company with international operations, holds the current advertising contract for LAX and other city airports. The Ethics Commission reports show that a total of 23 lobbying firms were registered to lobby on behalf of one or more of the nine billboard companies. 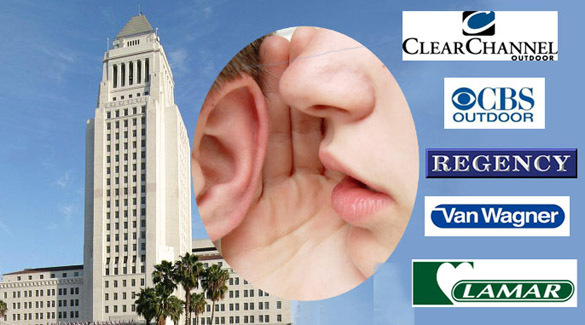 Billboard companies spent almost $700,000 lobbying Los Angeles city officials in the first quarter of this year, according to City Ethics Commission records. That’s a threefold increase over the amount the companies spent in the same three-month period of 2012. Billboard companies and their employees have contributed $162,000 to this year’s municipal election campaigns, according to City Ethics Commission records. Contest Promotions sign in L.A. advertising movie "Repo Man." Sign has city permit for "on-site" advertising. 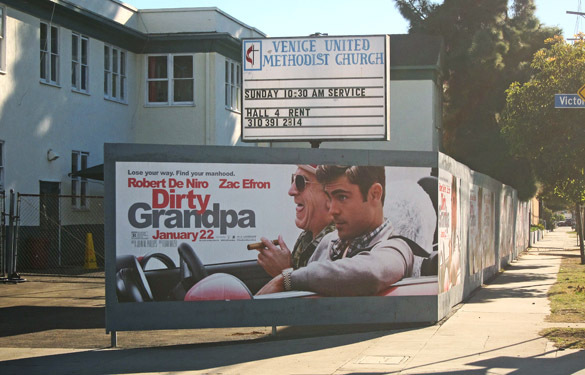 In 2002, voters in San Francisco overwhelmingly approved a no-exceptions ban on all new billboards and other forms of off-site advertising. 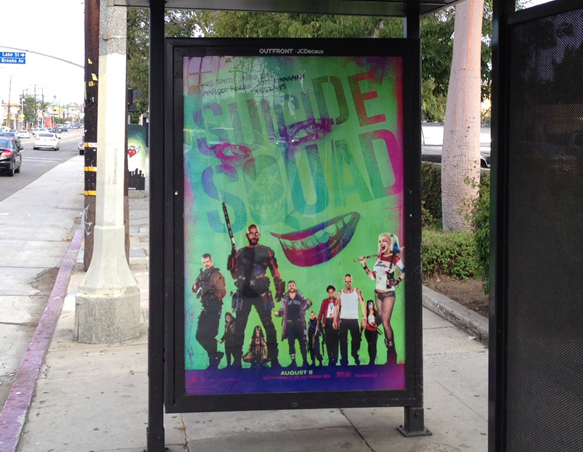 However, last week an L.A.-based sign company won a ruling in federal court that could seriously undermine that ban, and may have implications for the effort to limit outdoor advertising here in Los Angeles.